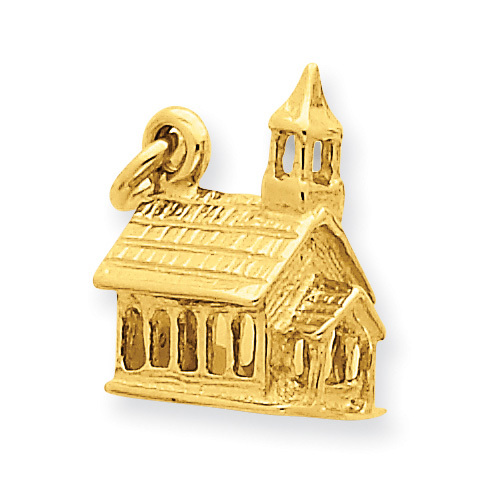 The Church Charm Pendant from Apples of Gold Jewelry is a 3D design of a Church building made from 14K Gold. The church pendant weighs approx. 3.13 grams of 14k solid gold. It is a beautiful pendant for anyone both young and old to have on a chain as a necklace as a constant reminder that we as Christians, as believers, are the Church, nor should we forsake the assembling of ourselves together as the church. "Not forsaking the assembling of ourselves together, as the manner of some is; but exhorting one another: and so much the more, as ye see the day approaching" (Hebrews 10:25). The Church Charm Pendant measures 11/16� long x over 1/2" tall. The charm pendant church design is simple yet so symbolic and is the perfect size to wear with a necklace or even add on to a bracelet. �For we are members of his body, of his flesh, and of his bones� For where two or three are gathered together in my name, there am I in the midst of them.� (Ephesians 5:30; Matthew 18:20). We guarantee our 14K Gold Church Charm Pendant in 3D to be high quality, authentic jewelry, as described above.